Limestone is a gorgeous, aged rock that attracts people with its unique appearance and ability to tell a story through its age. It is a sedimentary rock that is formed by calcareous remnants of plants and animals alike, sometimes even having sea creatures within the body of the stone. The rock comes with lots of variance in texture and hardness, though usually is smooth and granular. While Limestone can, and is often polished, it it important to note that it will never have the same high gloss finish as polished granite and marble. More popular than polished limestone, is honed limestone, which keeps a more natural finish to the limestone. 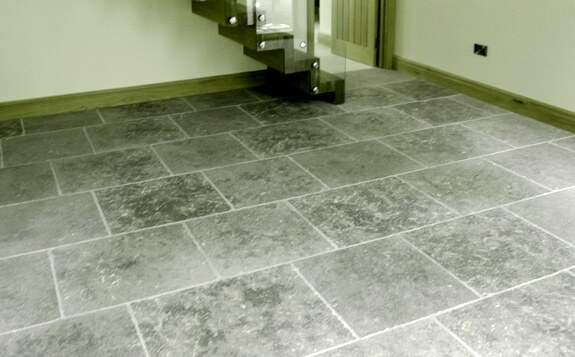 With limestone being an increasingly more popular option for stone flooring, it is important to take into consideration the specific needs of the stone in order to keep it in good condition for an extended period of time, preserving your investment in the stone. Limestone is especially vulnerable to etching from acids, including carbonated sodas and juices. Limestone is also particularly porous, making oils absorb into the surface easier than granite or marble. Most cleaning products are acid-based and pose a threat to your sensitive limestone, so they should be avoided. In order to protect your limestone floors, they should be sealed. Sealing of the limestone floors will help buffer your stone against etching and can help prevent staining, while also reducing the effects of dirt and soiling. Once your floors are sealed, the cleaning and maintenance of your floors will be the most important part of maintaining their appearance and keeping them looking great for years to come. Daily surface cleaning is recommended to avoid the build up of dirt and grime, which can be pushed into your delicate stone leaving it etched and damaged. It is recommended to have regular bi-annual professional cleaning done to your limestone floors. Those in homes with children or pets may require more frequent cleaning in order to protect you stone and keeping it looking amazing for years to come.